Blackmore’s Night newest release called Autumn Sky is a #1 Billboard Charting album off to a very strong start, especially when you consider Autumn Sky acquired the #1 position on the Billboard New Age Charts upon its debut in January, 2011. This legendary renaissance inspired New Age and Folk Rock touring band has a long history for producing top of the chart and award winning instrumental melodies over the course of many years, and there is no end in sight. Ritchie Blackmore & Candice Night are the Grammy Nominated, award winning musicians that make up the core essence of Blackmore’s Night and 7 member troupe on Autumn Sky, who wear renaissance attire of centuries past while performing at concerts, fairs, and festival events. Ritchie Blackmore is a legendary guitar player who has made progressive transitions in music having been a long standing band member of Deep Purple and then founder of the band Rainbow. Candice Night is an instrumentalist and the group’s songwriter, whose voice and lyrical point of view is one of enchantment while singing in the forefront on Blackmore’s Night albums. 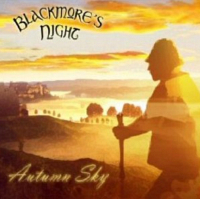 Blackmore’s Night 2011 release Autumn Sky greatly accentuates these elegant vocals delivered by Candice, along with ancient and modern instrumental fanfare for which they are famous. Here you will find more traditional instruments of keyboards, violin, woodwinds, acoustic and electric guitars are melded with old-world instruments like hurdy-gurdy, chanters, mandolin, vintage percussions, and woodwinds. The international success for Blackmore’s Night is not a fairy tale. The exclusive musical focus they have engraved for themselves has resulted in an enormous following in North America, South America, Europe and Japan. Their melodies have gained crossover prosperity by the enchanting lyrical vocals and fascinating instrumental music that often contains metrical structures dating back to the seventeenth century. Blackmore’s Night prior album Secret Voyage is another recent achievement, likewise debuting at #1 on the Billboard New Age Chart where it remained for four consecutive weeks. In addition Secret Voyage continued to remain on Billboard’s Top 10 Chart for a remarkable 72 weeks. Secret Voyage is another great album with a more mystical feel. The song Rainbow Eyes, which is one of my all-time favorites, is an excellent version of an earlier cover song from the band Rainbow. Charting on Billboard is a good way to measure the accomplishments of any group, but what makes Blackmore’s Night a true winner is their consistent ability to create transcending music which varies with every album they produce. This renaissance inspired band which transports progressive music into contemporary times is a model for success. Past, present and future. Blackmore’s Night touring band consists of Ritchie Blackmore, Candice Night, Bard David of Larchmont, Gypsy Rose, Earl Grey of Chimay, Squire Malcolm of Lumley and Albert Danneman. Note; The Blackmore’s Night album Autumn Sky has been listed in the top 10 on Billboard’s New Age chart for the past 8 consecutive weeks. Visit blackmoresnight.com to sample / purchase or visit their Amazon.com page. Check the latest news and tour dates and then visit candicenight.com for more info regarding this award winning group of musicians. Cover art courtesy Jeff Pickett-Pickett Productions.